Abstract: This current text reports on a musical work written in 1970 with the help of the Electrologica X-8 computer of the University of Utrecht, Holland, using the program PROJECT 2 by Gottfried Michael Koenig. 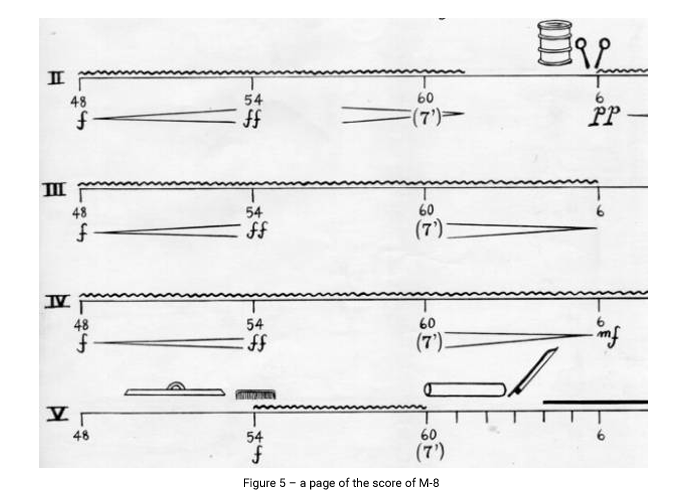 This article, which deals historically with the retrieval of the work, offers a musicological treatment of the composition referred to, which was written to be performed by a group of musicians who made live use of scrap and common daily objects, such as: glass and plastic bottles, dustbin lids, iron pipes and cardboard tubes, papers, nuts and bolts, marbles, plastic counters, index cards, oil drums, etc. This was the original idea, which, in that year of 1970, was courageous and innovative. This was at a time when ecological proposals had not been considered and were not yet in fashion. On the other hand, the work made use of Koenig’s subprograms, which although studied in classrooms in Utrecht, only came to be published in December of 1970. The historical focus thus is intended to indicate the direction of a musicology of contemporary Brazilian creation, which has the computer as cooperator. The will to make music with the sounds of things emerged in the Torcuato Di Tella Institute, in Buenos Aries, following up an idea I had launched, in a collective improvisation session, to the other scholarship students in the Latin American Center for Advanced Musical Studies. The first experience was formed in a collective composition entitled Objects. Although the musical result had not been relevant, it served to demonstrate that it was possible to be thought of as a type of “live concrete music”. The idea matured in Utrecht in 1970, with the cataloguing of a typology of sounds of materials: simple lines, spectra of lines, dry dot sounds, reverberating points, wrinkled and woven lines. The structure of the piece was developed in a logical and progressive manner, after the conception of a model of continual transformation: sound phenomena progressing from the most simple to those of great complexity. Scattered points would be gradually transformed into clouds, constellations, wrinkled lines, etc, until a wide spectral band was achieved. Only the use of a computer would permit the calculation of the numbers necessary for the assembly of a perfect and gradual transformation of parameters. This text is intended to contribute to the history of Brazilian computer music, in particular, that called algorithmic music. However, bearing in mind that the use of random number generating routines was the principal process used in the work studied here, I prefer that it be called music made with computer assistance. 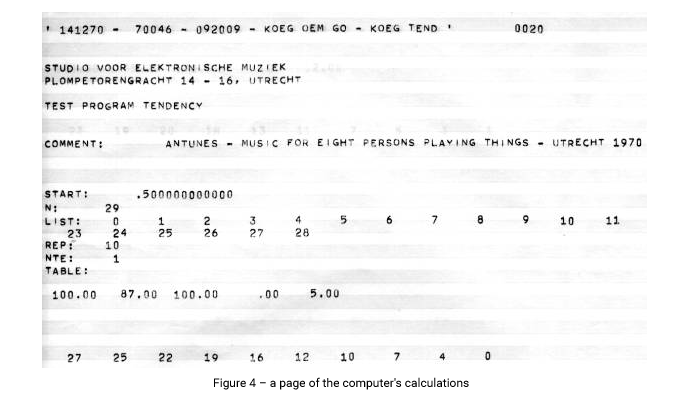 It was thanks to the University of Utrecht’s Electrologica X-8 computer, in the period from October to December 1970, that it was possible to write the work entitled Music for Eight Persons Playing Things. The long title of the piece was replaced, in the drafts, by the abbreviation M-8. In the first month of studies at the Instituut voor Sonologie, Utrecht, in 1970, I realized that some test programs of Project 2, the new program written by Gottfried Michael Koenig, could be the tools which I would need: a program for the calculation of variations of musical structures. “The program is fashioned in such a way that its user defines the compositional rules and also provides the data. Seen in this light, the computer does not ‘compose’; it merely carries out the orders, which it is given… In other words, the computer can help solve problems which previously had to remain unsolved, because of the of time it took to solve them.” (Koenig, 1970, p.8). Project 2 is written in ALGOL 60 language and consists of three parts with a preliminary program. This serves to enter and convert data provided by the composer into code. The other two parts of the program are designed, respectively, to arrange the ordination of parameters and to arrange temporal organization. “Koenig suggests that computers provide the essential means for realizing composition in which the sound patterns and the rules of composition are closely linked, … He compares deterministic means and chance means which of producing components of a score, pointing out that chance is ‘serviceable’ if a process requires variants or if minor details are unimportant.” (Hiller, 1971, p.86). The problem that I wanted to solve referred basically to the density parameter. I was also interested in the collaboration of the computer in the timbric construction of the piece. 1st – The rapid succession of dot sounds produces a line (a sustained sound). This concept was inspired by the experience, which led Pierre Schaeffer to establish the notion of a grain of sound (Schaeffer, 1966). 2nd – Between the dot sound and the sound line there is an intermediary phase, which consists of the so-called resonant dot sound (reverberating barren sound, or short sound followed by some resonance). 3rd – The chaotic agglomeration of dot sounds gives rise to a cloud of sounds. This concept was inspired by the experience of Xenakis and in the compositional theory of Luis De Pablo (De Pablo, 1968). 4th – Returning to the first concept, it is necessary to point out that the line resulting from the accumulation of rapidly emitted dot sounds, comes to be a wrinkled line. The sound sources that I selected to produce wrinkled sounds were those produced by friction, scraping, tremolo, by the acts of crumpling and tearing (paper, magazines) and by the acts of shaking, shuffling and collision (nuts and bolts, plastic counters, marbles, etc). 5th – At the limit, the wrinkled line becomes a sustained continuous line. This new sound behavior is verified when the high density of micro-sound samples no longer permits perception of the grains of sound. 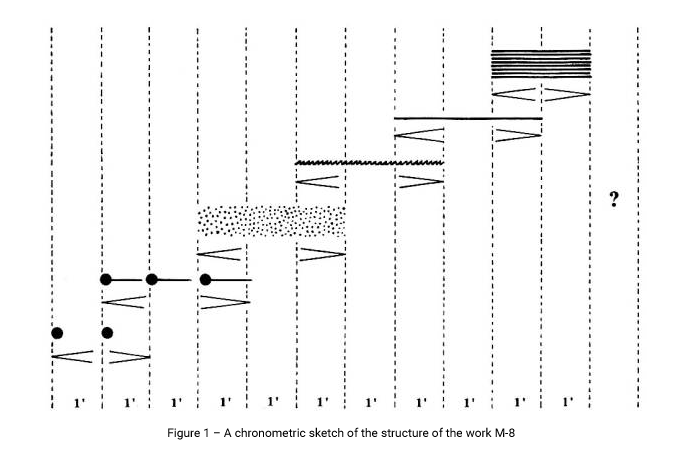 6th – The vertical accumulation of sustained sounds originates of sound spectra. These may have the character of harmonic or inharmonic clusters, but may also behave as wide changeable frequency bands. The main ways to produce this type of sound in my orchestra of things were: friction of the sides of the oil drum with pieces of styrofoam, the friction of a double-bass bow on the rim of the oil drum, on the sharp edges of dustbin lids and on the edges of the cardboard and iron tubes. Figure 1 is a sketch of the structure of the piece. It was intended to build a progressive sound transformation, live, which would carry a rarefied dot sounds sequence to be transformed – gradually and without interruption – to a wide, rich and complex spectrum. The changes of sound behavior and typology would occur in an imperceptible way. This was the great challenge. For this, I was seeking the collaboration of the computer, but I already held an intuition that strategic treatment of sounds overlapped by cross-fade could well lead to a solution of the problem. “The overlapping of different pitch ranges, on the other hand, might guarantee timbric heterogeneity of the resulting cloud of points, in such a way that the superposition of patterns might not be perceptible to hearing, being chamfered in different timbric bands.” (Antunes, 1989, p.141). On consulting the printed definitive musical score, one may verify that musical invention permitted exceptions to the rigid structural rule. Contrapuntal elements were introduced in the discourse, deriving from subjective musical criteria. “There are two general classes of random processes which have been used to generate material for music composition: random processes with independent observations, and processes in which previous results influence the current outcome in some way” (Dodge & Jerse, 1985, p. 265). I became fascinated with the possibility of instigating the computer with rules and data, so that it might instigate me with new data and arrays. Sound sources and modes of execution. A collection of objects of many different shapes, sizes, volumes and materials guaranteed the availability of a rich palette of sounds and noises. Simple everyday things could, thus, be elevated to the category of musical instruments. 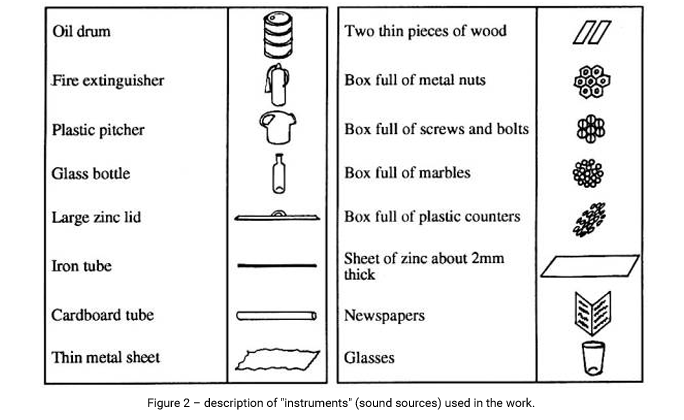 Figure 2 shows a description of the “instruments”, with their respective symbols: 2 oil drums, 4 fire extinguishers, 5 plastic pitchers, 8 glass bottles, 3 tin lids (water tank and dustbin), 10 metal pipes, 3 cardboard tubes, 5 large sheets of metallized paper, 3 pairs of planks (floorboards), 1 open box of metal nuts, 1 open box of screws and bolts, 1 open box of marbles, 1 open box of plastic counters, 2 large sheets of galvanized tin, 8 newspapers and 4 glasses. 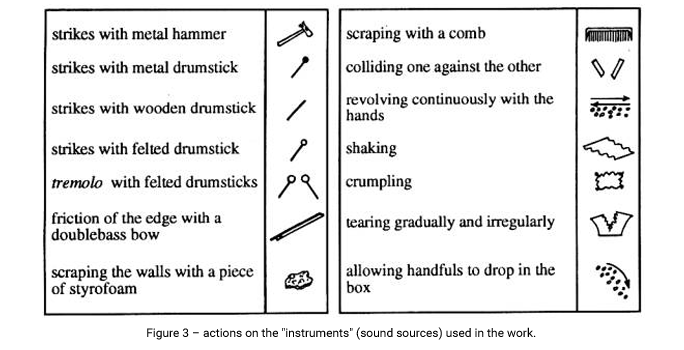 The variety of sound materials is guaranteed by the different modes of execution: tremolo or thuds with felted (muffled) drumsticks, strikes with wooden or metal drumsticks, friction of the edge with a double-bass bow, strikes with a metal hammer, scraping with a comb or a piece of styrofoam, agitating, colliding, shaking or revolving, allowing handfuls to fall into the box, crumpling, tearing, etc. The different modes of execution, particular to each sound source, and their respective symbols are described in figure 3. Three of the selection programs of Koenig (integral test-programs of Project 2) were to be extremely useful for me: the program ALEA, call number 1; the SERIES program, call number 2; TENDENCY program, call number 6. 1 – in what way should the density of a section in the form of dot sounds grow, in a sequence of one minute’s duration, so that it is overlapped, gradually and imperceptibly, with an emergent section of resonating dot sounds? 2 – in what way should the density of a section in the form of resonating dot sounds grow, in a sequence of one minute’s duration, so that it is overlapped, gradually and imperceptibly, with an emergent section of clouds of points? 3 – in what way should the vertical density of a section in the form of clouds of points grow, in a sequence of one minute’s duration, so that it is overlapped, gradually and imperceptibly, with an emergent section of continuous wrinkled sounds? 4 – in what way should the horizontal density of a section in the form of wrinkled sounds grow, in a sequence of one minute’s duration, so that it is overlapped, gradually and imperceptibly, with an emergent section of sustained smooth sounds? 5 – what sequence of densities should be used so that dot sounds (plastic pitchers struck with a muffled drumstick) agglomerate gradually and vertically, in a section of one minute’s duration, with an emergent section of resonating dot sounds (glass bottles struck with a wooden drumstick))? 6 – in what way should the vertical density of a section, in the form of smooth sustained sounds grow, in a sequence of one minute’s duration, so that it is overlapped, gradually and imperceptibly, with an emergent section of complex spectra with wide band frequencies? The different questions were organized in such a way that it would be possible to make use of the three selection programs: Tendency, Alea and Series-In. 8 times supplies 10 numbers between 0 and 28, in increasing order. Tendency Section of dot sounds. 4 times supplies 10 numbers between 0 and 28, in decreasing order. 8 times supplies any 10 numbers between 12 and 28. Alea resonating dot sounds. 4 times supplies 10 numbers between 0 and 14, in decreasing order. 1 time supplies 4 numbers between 0 and 60, in increasing order. 1 time supplies 5 numbers between 0 and 60, in increasing order. ALEA is a selection program, which chooses, randomly, elements of a data set. The elements are considered as “samples” and, thus, can be used repeatedly. Before providing all the elements of the data set, there is no verification of possible “premature” repetitions of elements. (Koenig, 1970, p. 38). a and z indicate the random range [a less than or equal z], whilst RANDOM generates numbers equally distributed between 0 and 1.
stable density between a section of crescendo and a section of decrescendo, guaranteed the construction of rich constellations of sounds of different timbres (glass, plastic and wood). SERIES-IN is a test program, which also chooses, randomly, elements of a data set, but with the “samples” being removed from the supply. In contrast to ALEA, repetitions are prevented and thus the program guarantees that no element is repeated until all numbers have been selected. In order to check for repetitions, the program has an array r which contains elements indices. Thus, in the work M-8, the sections in which the program ALEA was used are presented as constructions in which numbers determining vertical densities form groups of the arrangement type. The stability of density (vertical sum of number of elements), are thus verified in these transition sections. TENDENCY is a test-program which makes it possible to define a particular part in the ensemble and which makes selections in this part with ALEA. In this way, in the realization of a pre-established musical structure, it was possible to make gradual transformations of density – increasing and decreasing – with the full participation of chance in the creation. “The methods of generation of Koenig’s program are based on chance. A new and important concept, which came to be introduced, is the tendency mask: a criterion with which the composer can control, in a precise way, what he wants at each moment. (Nunez, 1993, p. 179). The concept of a “window” or “tendency mask”, has had important influences in computer music. The same concept came to be used by Barry Truax in his POD System for the composition of music assisted by computer (Truax, 1977). “TENDENCY establishes a “window“ of a specified size through which sequential elements of a group can be viewed and then chooses randomly among the elements within the window.” (Dodge & Jerse, 1985, p. 299). The work is written in proportional notation and may be played by groups of 8 musicians, amateurs or professionals. Its first world première was in Bilthoven, Holland, on 12/09/1971, selected in a competition for young composers of the Gaudeamus Foundation. In that event, it won the AVRO Prize of the Gaudeamus Contemporary Music Week, François Bayle being president of the jury. In figure 1, in which the structure of the piece is presented, there is a question mark at the end of the work. This sign of doubt was roughly sketched in the first outline of the composition: the decision how to “end the work” was postponed. After the work was finished I decided to include the final unusable: the performers – each of them armed with a double-bass bow – would abandon the stage and move towards the audience. Each of the musicians should go to investigate and search for an interesting sound in the public. The sources of sound to be found are always the most variable: strands of hair from persons in the audience, shoelaces, fringes of the theatre seats, handbag straps, wall corners, personal belongings of the audience, etc. When the conductor observes that each musician has found “his sound” he stops the mass of sounds in order to produce a final attack on the same “accord of noises”. The score was published by the Italian publisher Suvini Zerboni, of Milan, in the same year of 1971. In 1972 the work was presented in Paris, in the Théatre de la Cité Universitaire, in a concert of French Government scholarship composers. In the group of performers, conducted by the composer, were, among others, the then students Denys Smalley, Klaus Ager, Stanley Haynes, Peter Schuback, Mariuga Lisbôa Antunes and Eliana Carneiro. The music provoked polemic and fighting in the audience. One third of the Latin-American public was jeering “maricon” at the author! Two thirds of the audience applauded frenetically and two groups confronted each other with violence. Shoes flew and the Ambassador Alvaro Franco, at that time the Cultural Attaché of the Brazilian Embassy in Paris, was cowering with embarrassment and apprehension. Since the 70’s the work has been presented by musical groups in Rio de Janeiro (Grupo Ars Contemporanea, de Guillherme Bauer), São Paulo (John Boudler`s ensemble), Paris (Marius Constant`s ensemble), Holland (Peter Keuschnig`s ensemble), Brasília (GeMUnB), São Bernardo do Campo (group of music students, including the participation of the then young student Wilson Sukorsky, who carried out the arduous task of collecting the objects from junk yards in the city), Rome (Quartetto Italiano and others), La Rochelle (group of adolescent music students), etc. The utilization of Koenig’s test-programs was extremely useful in the compositional work. Mathematics in general and numerical orderings in particular are always present in the work of art, as is the faulty intuition of the artist. “…so that music may constitute itself as a language it needs to have an order by which it can manifest itself. And an order, whatever it may be, can admit a numerical representation, which does not, by any means, pose a limitation, but just the assertion of a simple fact” (De Pablo, 1968, p. 53). The efficacy of the process, in which the computer assists in the calculation of complex questions, even sometimes used in a random way, has permitted the tripod artist-machinechance to provide organized material for live performances, in which a new tripod, this time artist-objects-chance, could be confronted by the challenges and the traditional conditioning of aesthetic perception. “Gottfried Michael Koenig affirms that the composer should not only select, but also have some influence on the agents which prepare the selection options” (Roads, 1978, p. 13). In making use of the test-programs of PROJECT 2, giving participation to “mechanical chance”, I conclude that the simple use of sub-routines served Koenig’s investigator spirit. He was interested in the idea of the composer being a “selector”; the computer generating sound examples of musical structures and the composer selecting samples from among the various possibilities generated by the computer. ANTUNES, Jorge. Notação na música contemporânea. Brasília: Editora Sistrum, 1989. DE PABLO, Luis. Aproximación a una estética de la música contemporánea. Madrid: Editorial Ciencia Nueva, 1968. DODGE, Charles & JERSE, Thomas A. Computer music: synthesis, composition and performance. New York: Schirmer Books, 1985. HILLER, Lejaren. Music composed with computers – a historical survey. In: The Computer and Music, edited by Harry B. Lincoln. Ithaca and London: Cornell University Press, 1971. KOENIG, Gottfried Michael. Project 2. In: Electronic Music Reports, Nº 3. Utrecht: Utrecht State University, 1970. NUÑEZ, Adolfo. Informatica y electronica musical. Madrid: Editorial Paraninfo, 1993. ROADS, Curtis. An interview with Gottfried Michael Koenig. In: Computer Music Journal, 2(3). 1978, pp. 11-16. SCHAEFFER, Pierre. Traité des objets musicaux. Paris: Éditions du Seuil, 1966. TRUAX, Barry: The POD System of interactive composition programs. In: Computer Music Journal, 1(3). 1977, pp. 30-39.